Meet the "Lazy Lee" shoe rack closet system. This patented design is poised to revolutionize your closet organization needs. 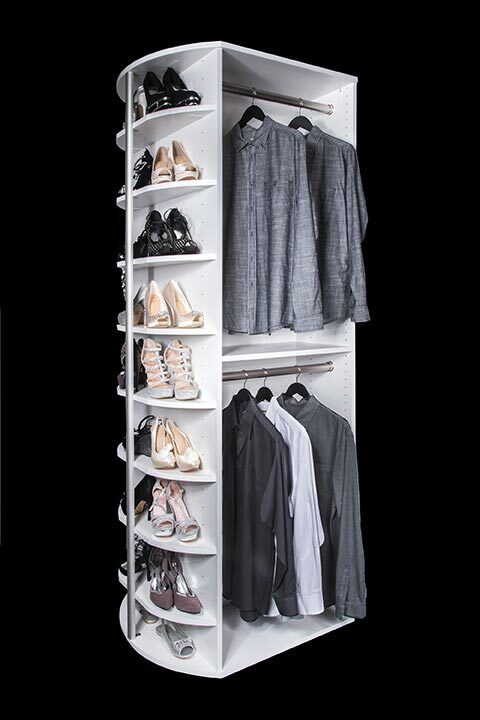 Sold under the 360 Organizer® brand name, the Lazy Lee® is a 360 degree rotating organizer that fits into your closet easily. It can be made with drawers, shelves and hanging rods as well for a fully customized closet. Dramatically increase your storage space to help organize your shoes, clothing and accessories. 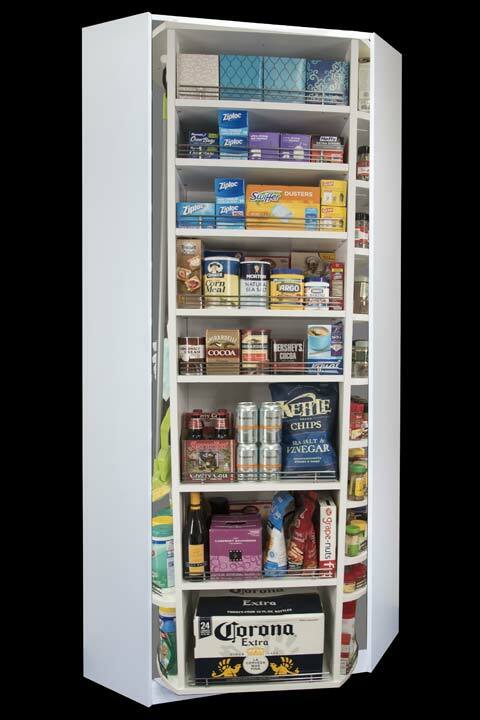 It is ideal for closets, but can also be used for pantries, wine storage and so much more. The 40-inch unit can hold up to 228 pairs of shoes. * Isn't that amazing? The Lazy Lee closet system spins 360 degrees manually. Seven standard models are currently available to meet your closet organization needs. All units can be customized to suit your particular situation and storage requirements. 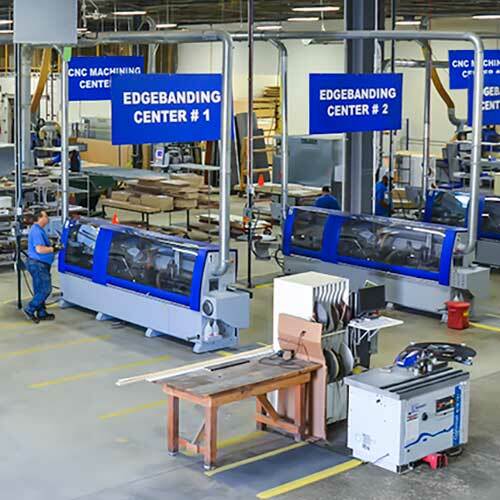 Possible customizations include lighting, mirrors, pull-out baskets, drawers, doors, belt or tie racks and more! The Benefits of Owning a Lazy Lee® Speak for Themselves! Perfect for closets, pantries, wine storage and more! 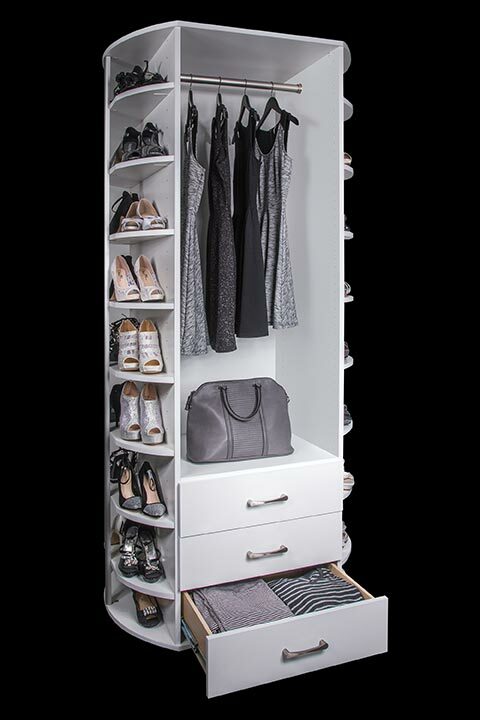 The 360 Organizer Lazy Lee® closet system also comes in a variety of colors to match your personal dècor. See our color samples for a complete listing of the available finishes. * Exact number of shoes will depend on size and style of shoe and may vary from 80 - 228 pairs of adult shoes. Mens shoes usually require more space than womens. The Shoe Spinner and Valet Built-in models are 911/2" in height and fit into either a 40" x 40" or 42" x 42" corner, depending on model. Baseboards will need to be removed in the corner where the Built-in models are located so they can sit flush against the wall. 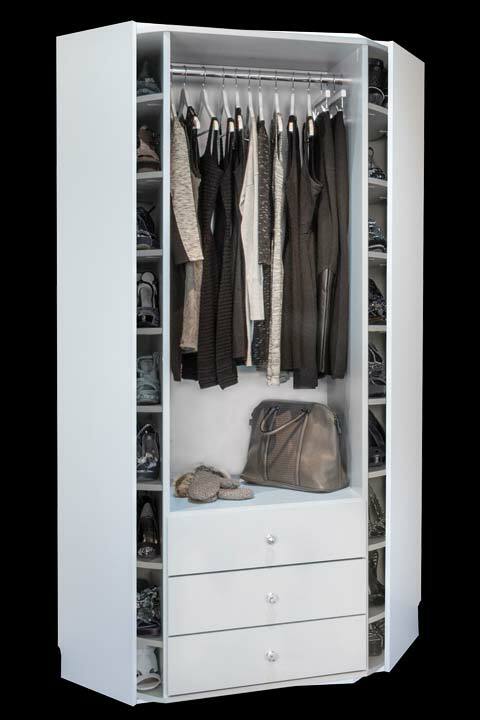 Our FS (Double Hang, Valet, Shoe Spinner) units are 89" high, do not require that baseboards be removed, and can be either integrated into a larger closet system or installed as free standing storage. The free standing units also require 40" or 42" floor space to spin easily. The pantry models always include a "Built-In" cabinet. Two models are available for either a wall or corner installation. 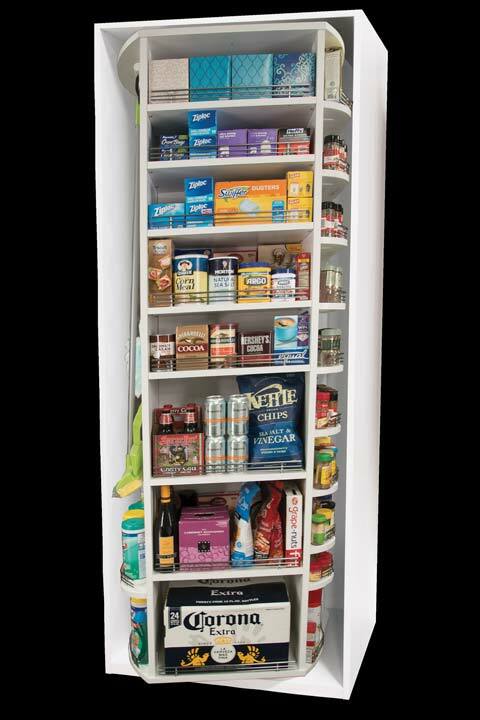 The Wall Pantry is 31.5"W x 26"D. The Corner Pantry is 32.75"W x 32.75"D. Both models stand 84" high. Since 1987, Closet Works has been the premier provider of high quality custom closet organization systems to the entire Chicago area. If you're tired of disorganization and closet clutter, Closet Works can help. From closets to mud rooms, wall beds to home offices, pantries, wine rooms, garages and more — Closet Works designs and manufactures products to fit every organizational need. To get started with Closet Works, call us at 800-425-6738 or fill out the form below to schedule your complimentary in-home consultation. Start making the most of your closet space today.